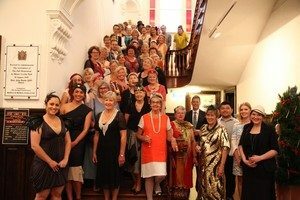 Established in 2003, Auckland Decorative & Fine Arts Society (AkDFAS) promotes and advances the cultivation, appreciation and study of decorative and fine arts, along with contributing to the preservation of New Zealand’s artistic heritage. The lectures are held at the Auckland University – Room B28 below the University Library. Entrance off Albert Street, Auckland City. Parking is available in the Owen Glenn Building (entrance off Grafton Rd) for a $6.00 flat fee (cash helps). Guests are most welcome ($25.00 per guest) but we would appreciate their names in advance so name tags may be prepared. Please email membershipakdfas@gmail.com. Lectures are held in the evening 7.30 pm to 8.30pm. A sandwich and glass of wine is served after the lecture. To apply for membership, please download the AKDFAS 2019 Subscription Notice, complete and send it with your payment according to the directions on the form. Membership is limited to 300. If numbers exceed 300, your name will be placed on our waiting list and you will be given the opportunity to become a member at the beginning of the next calendar year. Subscription notices are mailed in December and are payable by February 1st. Membership is not transferable, however Members’ guests are welcome. There is a charge of $25 per guest per lecture, and $15 for visiting members of other New Zealand DFAS Societies. Please notify membershipakdfas@gmail.com by the Monday evening prior to the Wednesday lecture if you are bringing a guest. Please click on the button to the right for biographies of lecturers and topic synopses. Thomas Heatherwick – The Modern Leonardo? AkDFAS enjoys a close relationship with the Art Gallery of Auckland and has provided financial support for a number of projects including the restoration of an important 17th century French engraving ‘The Mocking of Christ’. Currently AkDFAS is contributing to a major research and exhibition project examining the work of Frances Hodgkins. With leadership from AkDFAS, all eight New Zealand DFAS Societies have contributed to this project. A long-standing partnership with the TSB Bank Wallace Arts Centre at The Pah Homestead sees AkDFAS providing two volunteers to act as hosts every hour the Gallery is open. The Arts Centre hosts a changing programme of contemporary art exhibitions curated from the James Wallace Arts Trust Collection of over 8,000 works as well as regional touring exhibitions. The Arts Centre also runs ongoing community education programmes targeting Auckland schools and the wider public. An artist in residency programme in association with the Otago University is an important component of the Arts Centre. The AkDFAS partnership also provides for exhibitions curated from the extensive collections of the Hocken Library.